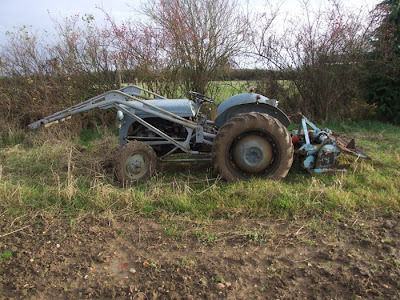 Heres our tractor, a t20 fergie from which I also own near all of the machinery/equipment to go with it which is handy. After looking for some decent benching to rack my new greenhouse out I was quite surprised at the amount of money they charge for, lets face it a pile of crap. 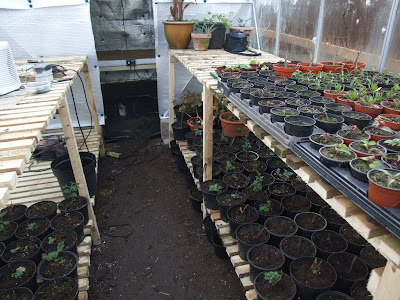 Considering I needed a bench either side of the greenhouse minus the partition section because thats the grow room, it would have cost me a small fortune. So i built it myself with timber from Clarks all for £81. I made it in such a way that I can remove it very easily, yet very strong and stable. Its basically two tier with free standing legs, the bench at the bottom in two sections for easy removal, the top bench all in one for stability and again all removable and built to fit my needs. 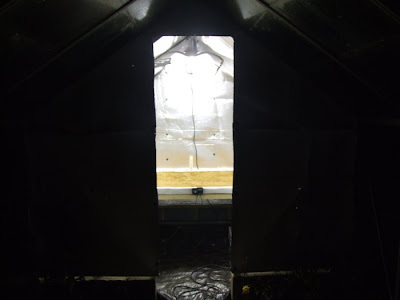 My greenhouse is now complete, including the grow room as I have now fitted the extractor fan, all ready for winter. I still need to decide on the bulb I will use this year for my growlight. If anyone out there uses growlights then a little tip: Leeks prefer a blue spectrum to anything else, the more lumens/lux you have the better they will grow. Just make sure you can keep a constant temperature, to much heat will destroy your leeks/onions making them leggy. More on this later when we get a bit closer to growing them. All my seeds have come and these are put in an air tight container and placed in the fridge. 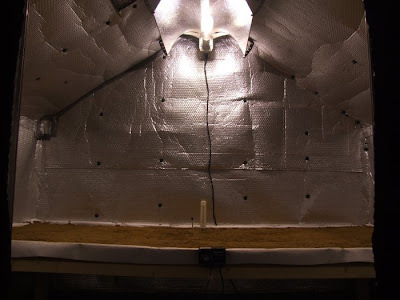 This believe it or not keeps them dry, no light, cool and a constant temperature, ensuring you get good germination when you are ready to plant them. You can even freeze seed for some years, if you have any left overs and won't be using them that year, put them in the freezer. Heres my grow room that I have rebuilt for this year. 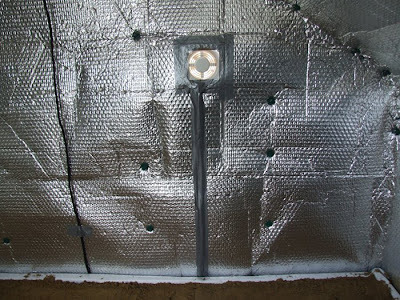 I have used the back partition of my greenhouse which I insulated with Thermawrap, a type of bubble wrap with reflective foil on it normally used behind radiators to reflect the heat back into the room. I am using again a 600 watt powerplant pro mantis metal halide grow light. One thing to mention if anyone uses a growlight: remember to replace the bulb every year, its not worth taking the risk, it may still light up but that doesn't mean you are getting the correct spectrum of light. I have yet to decide which bulb I will use this year, either a 600w Sunmaster Cool Deluxe or something with a few more lumens. Ventilation is very important and I hope to fit an extractor fan in the glass, I have an auto vent in the roof and will probably fit a louver window in the side somewhere so air circulates all around. My bench is just made of some timber legs with a sheet of marine ply with a lip of wood at the top. This is all covered in that new roofing felt you can get that is waterproof to avoid any rot in the wood. My heating cable is sat underneath the sand which is on a thermostat providing me with bottom heat. Air temperature control will just be a 2kw electric fan. Keeping the sand moist will distribute the bottom heat evenly and avoid any hot spots. 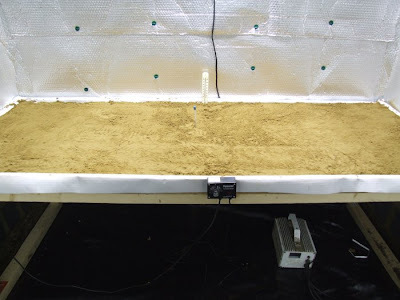 My bench measures 8x3ft and is 2ft high, most people will grow m2 when using a growlight as you can get more plants in the light, because I don't have the room to do that I will either remove some of the leeks when mature or apply supplement lighting to them as even a 600watt grow light will only cover 1.5m2. 1000 watt ballast assisted grow lights in my opinion are dangerous, maybe future models will be better. Removing some leeks wont be a bad thing as I need to keep some back a little for late September, these will grow on in my heated greenhouse, by then we will have a good amount of natural sunlight. Despite that this light will light my entire garden up when turned on that does not mean those plants get sunlight from the bulb, the spectrum of light is only beneficial to 1.5m2 square, a mistake a lot of people make. Well I have made all my orders now for any seeds, plants that I'm going to need for next season. I always order the day the catalog comes out as everything goes out of stock very quick. My medwyns catalog came last week which is where I order the majority of my stuff from. + Some others that I will order later as they are common. My grow room is nearly finished so at least that will be ready before winter sets in. Blanch Leeks: Pendle Bulbils 40 of them. I hope Medwyn can send 20 early December and 20 January so I can show leeks in September aswell. 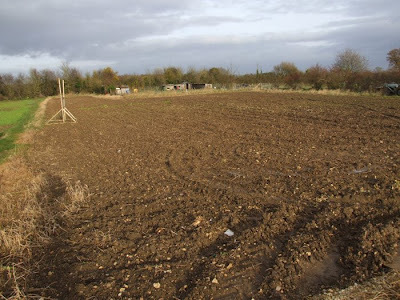 Last year I tested welsh seedling and the pendle leeks, both had there general faults and worrying factors. Welsh seedling's definitely grow slower than the pendle leeks but went over the top very quick in August where as the pendle leeks kept growing. I do like the fact that the welsh seedling leek has much stronger foliage and stands up by itself unaided, very handy when small as the leaves don't flop about the place. The pendle leeks did cause me the most concern early on in the season as they all seemed to develop footrot at some stage or another. This really put me off buying them again but I have made my choice because I feel they have more potential and are less likely to bulb at the bottom. If I can just avoid footrot this year I'm sure they will be great but I'm still very worried about this happening again as it really does destroy all your leeks once one has it. If this fails I will go back to growing Peter Clarke and the only reason I don't grow this leek any more is because they reach full potential later in the season and I don't do late shows. Onion Seed: My own selection and Medwyns Own selection. 30 Onion seedling backups from Medwyns aswell so I have a good chance of getting some decent onions. Again Kelsae onion is the strain and being planted inside this year I hope to get at least 45 planted inside the tunnel. Marrow: Blyton Belle, Table Dainty, Bush baby, Long green Bush. Plant them later this year as my best marrows came a bit early. Runner beans: Stenner, will grow about 50 plants from a mixture of medwyns selection and my own. Carrots Long: My own and Medwyns. Stump carrots: Sweet candle and a new unnamed stump carrot trail. Will be a test this year as my stump carrots are always bankers only having to pull 4 carrots to make a set of 3 is handy. I can no longer buy this stump carrot seed and mine wont be ready for seed until the following year. The longer stump carrots are harder to grow as they wont all be straight. I'm sure they will be decent clean carrots but the majority will have a bend so getting a good set will require more carrots to be pulled. Cauliflowers: Not that impressed with Beauty to be honest which is what i grew this year. Dok elkon? is what i use to grow, amazing cauli..cant get this anymore. Despite Beauty being very white I found the curds went out of shape and sometimes slight gaps on the larger heads. This year I will be giving Concept a go as i like the sound of tight self wrapping leaves. I may grow a few coloured varieties aswell for fun. Celery: Evening Star: I still feel this is the best celery to grow for the show bench. I have tested Starburst, Morning Star, Ideal and Redstar and Evening Star always stood out as the best. I did grow Redstar last year aswell which i was very impressed with and comes a close second. I would grow Redstar again but growing one variety ensures I have more sticks to select from in what little good ground I have to grow my show celery in. I hope to make another raised bed up to grow some Redstar in the future. Cucumbers: King George and Carmen. 250g onions: Marco, amazing onion when grown well very hard to beat. Parsnip: Gladiator and pinnacle, would love to try picador aswell but don't have the room. I will only grow a few pinnacle, as I do every year I test just a few of anything that i feel has potential. Gladiator has always worked for me so there is no need to change that. I grow 25-30 gladiator until I grow something that when i pull up is better and then grow 25-30 of them. Last year I tested a few albion, good parsnip, not as white as you would hope, carries its weight but not better than gladiator so won't grow again. Peas: Show perfection, own selection. Shallots: Hative De Niort, aristocrat: Own selection and some mail order.